If you’re British like I am, you’ve probably made a million full English breakfasts in your life (or whatever your regional equivalent is called). You’ll have your own favourite elements to include and your own cooking methods, and you won’t need me to tell you how I make mine. 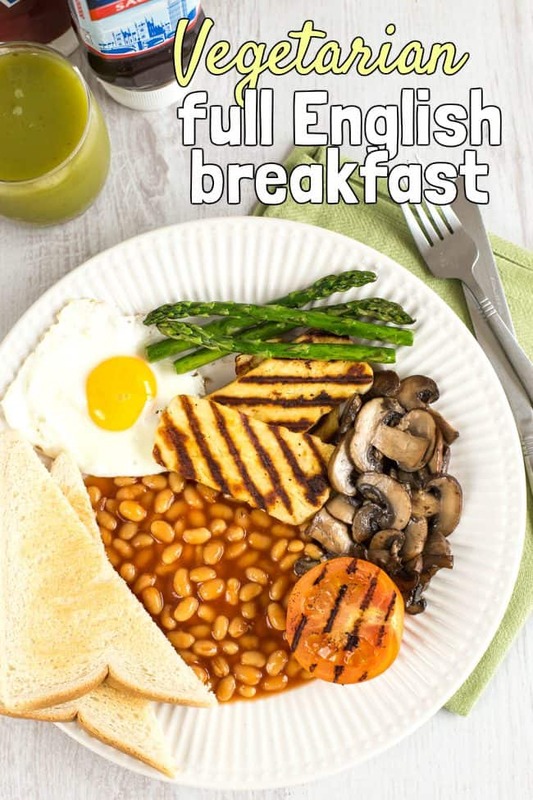 This post is more aimed at my lovely international readers, who may hear ‘full English breakfast’ and immediately think of sausages, bacon, black pudding, and all sorts of other not-very-vegetarian-friendly ingredients. While those are definitely traditional elements, it’s totally possible to make a vegetarian full English breakfast that’s just as satisfying (and just as effective at curing a hangover). I must admit, I don’t often make such an extensive full English breakfast at home – only on special occasions. You’re more likely to find me ordering one at a greasy spoon on a Saturday morning (at least, you were in my student days). But it’s not hard to make a decent one at home, and even though there are quite a few elements to cook up at the same time, they’re all easy. 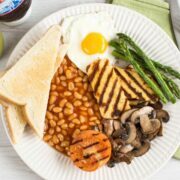 Sautéed mushrooms, grilled tomato, a fried egg, and proper British baked beans – all nice and simple. Just make sure you use a proper British brand of beans, none of this BBQ beans rubbish! These ones* or these ones* are both great. All that’s left is to decide what kind of cuppa you want on the side, whether you’re a red sauce or brown sauce* kind of person (I’m team ketchup), and what kind of juice you want (usually apple or orange… I went for a less traditional apple and kale juice, since I’m a poncey food blogger). 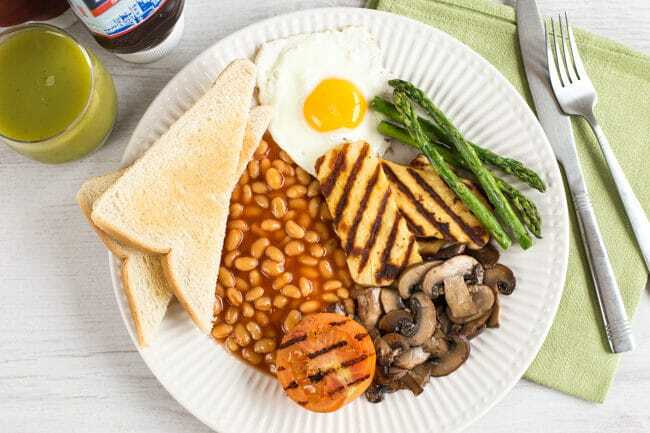 Obviously, to make a vegetarian full English breakfast you could just replace all the meaty parts with their vegetarian equivalent – veggie sausages, veggie bacon, etc. I’ve done this a lot, but this time I wanted to avoid using ‘fake meat’ (which I do enjoy, but sometimes it’s fun to be a bit more creative), so I added grilled halloumi instead. 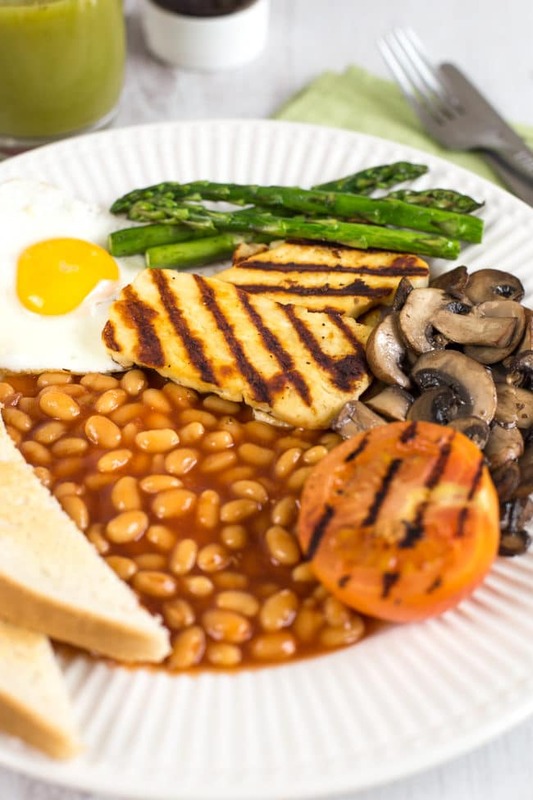 Halloumi is becoming a pretty popular breakfast option in the UK, and the first time I was served it as part of a full English, it was a revelation! The salty cheese goes so well with all the other elements. Heat the oil in a frying pan, and add the sliced mushrooms and asparagus. Season with a pinch of salt and pepper, and cook over a medium heat for about 5 minutes, until the mushrooms are soft. Meanwhile, heat up a griddle pan (or just another frying pan, if you don’t have a griddle pan), and add the tomato cut-side down, along with the slices of halloumi. Cook for a few minutes, turning the halloumi once it’s golden brown underneath (here are some more details about how to cook halloumi, if you’re not sure). Heat the baked beans in the microwave or in a small saucepan, stirring regularly. 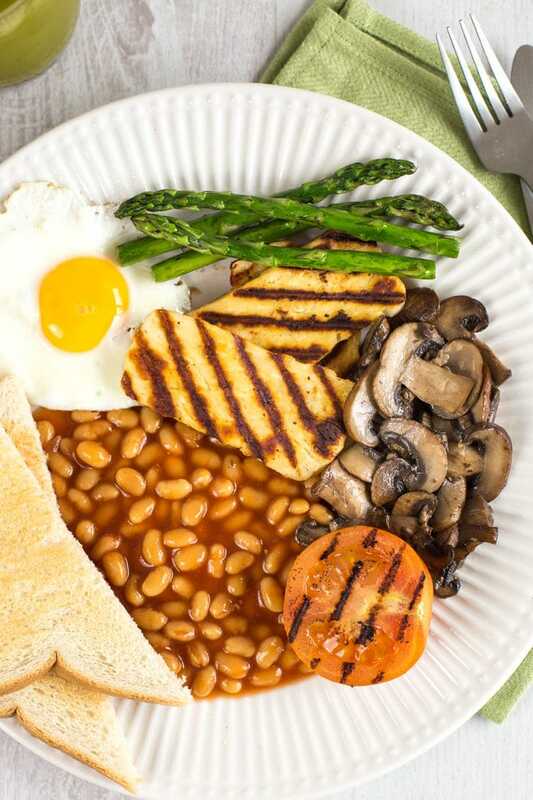 Serve all the elements of the vegetarian full English breakfast together, along with some slices of toast. * Note: This post contains a couple of affiliate links. If you make a purchase using these links, I will receive a tiny (tiny!) sum of money, at no extra cost to you. Thanks for the support! Good idea, the halloumi cheese, I will definitely try it in my English breakfast. Really, options are limitless :) I like to put potato in my version, usually cooked and then fried. Eggs are a must, some kind of beans usually is on the plate too. Tempeh, mushrooms, or any veggie fry up with onion and rosemary. Halloumi and asparagus looks like a great idea, definitely going to try this. Thanks! Love all your ideas! What a feast for breakfast! This is perfect weekend brunch food. Yes definitely not an everyday meal haha, but so good for a weekend treat! We regularly have a variation of this for tea as the kids (and veggie husband) love love love it! Halloumi is a great idea and will make a welcome change from poking veggie bacon around in a pan and trying not to burn it!!!! Really unusual muffin, thanks for the idea. Hello, I followed ur recipe of veggie enchilada w sour cream jalapeños sauce, it was great! easy to make, not time consuming! 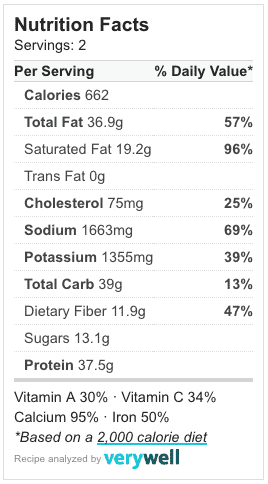 & very tasty…. thank u. Great to hear, thanks JD! The breakfast looks homey and yummy! !